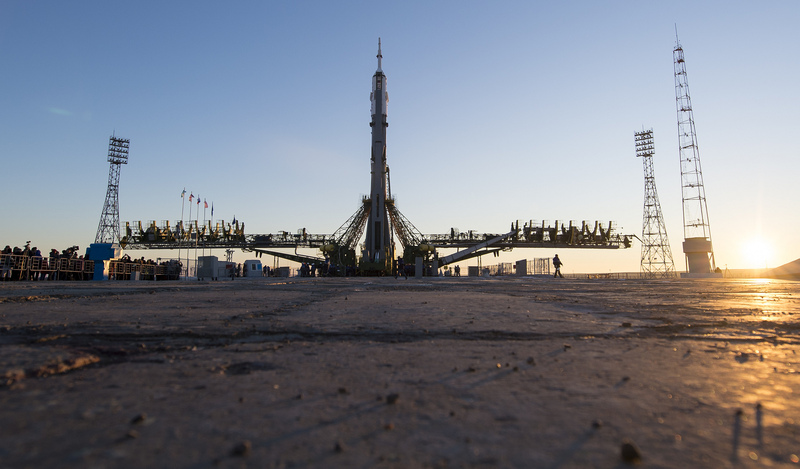 A Soyuz rocket began its rollout to its historic Baikonur Launch Site under a star-filled sky Sunday morning, arriving at the launch pad at sunrise – marking the start of final preparations for the launch of three International Space Station Crew Members. Five-time space flier Yuri Malenchenko, shuttle and ISS veteran Tim Kopra and first-time flight engineer Tim Peake are set for liftoff aboard their Soyuz TMA-19M spacecraft on Tuesday at 11:03 UTC to embark on a fast-track rendezvous with the orbiting laboratory for docking at 17:24 UTC, joining ISS Expedition 46 for a stay of seven months. Yuri Malenchenko, like both of his Soyuz colleagues coming from a military background, was selected as a Cosmonaut back in 1987 and made his first flight in 1994 to the Mir Space Station for a 125-day mission. He then joined the International Space Station Program and participated in the Space Shuttle STS-106 mission, a crucial assembly flight to ISS that prepared the outpost for the first resident crew living and working in space. Over the past 12 years, Malenchenko made three visits to ISS as part of Expeditions 7, 16 and 32/33. Having already logged 641 days in space, Malenchenko will add another 173 days to his record and end up in second place in the all-time list for cumulative time spent in space. Tim Peake can look back at a career in aviation, having flown over 30 different aircraft including a number of helicopters for which he held qualifications as pilot instructor, such as the Apache. He worked as a test pilot in the military and private sector before being selected by the European Space Agency as part of six new Astronaut candidates in 2009 to enter extensive training before receiving his first flight assignment. 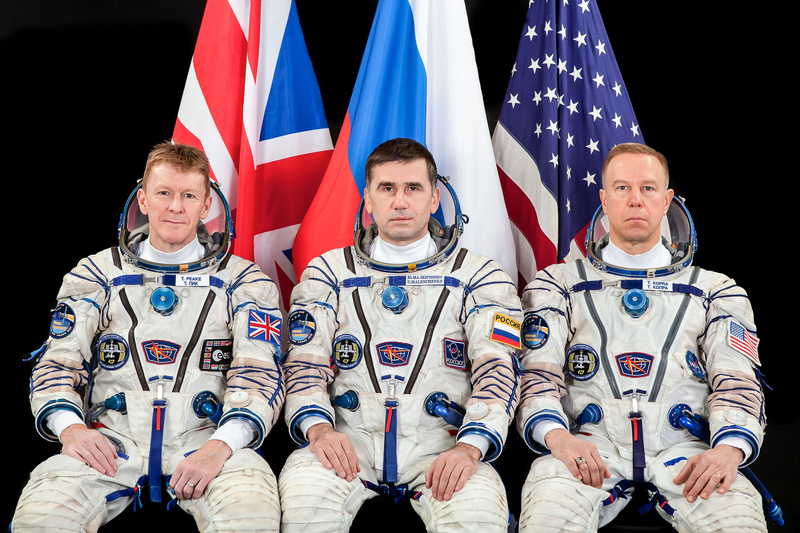 His mission as part of Expedition 46/47 has been named Principia. Tim Kopra, a retired Army Aviator, served on a number of military deployments before taking a job at NASA within the Space Shuttle Launch Operations and Space Station Hardware Testing branches. In 2000, he was selected as Astronaut candidate and completed two years of training. He made his first flight in 2009, taking off aboard Space Shuttle Endeavour, serving for a two-month leg of Expedition 20 aboard ISS and returning to Earth on Discovery for a total mission duration of 58 days. 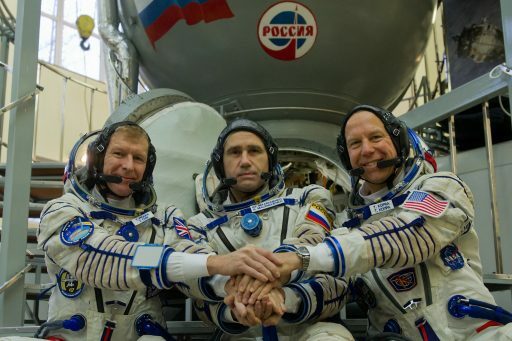 Malenchenko, Peake and Kopra have been working together as a crew since April 2014, Malenchenko being the late addition in what normally is a training flow of at least two years. They went through training at the various ISS partner space agencies in a long road to the launch site that took them several times around the globe. With their liftoff date getting closer, the Soyuz trio completed their final exams and simulations in Moscow last month, receiving the clearance to head to the launch site for a two-week launch preparation. 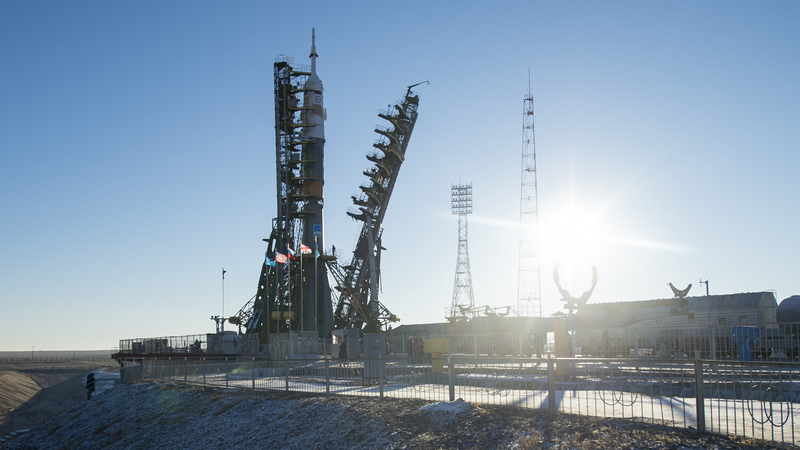 They arrived at the Baikonur Cosmodrome on November 30 and entered the typical preparations flow at a busy launch site where several launch campaigns are always underway at the different sites of the vast stretches of the Cosmodrome. 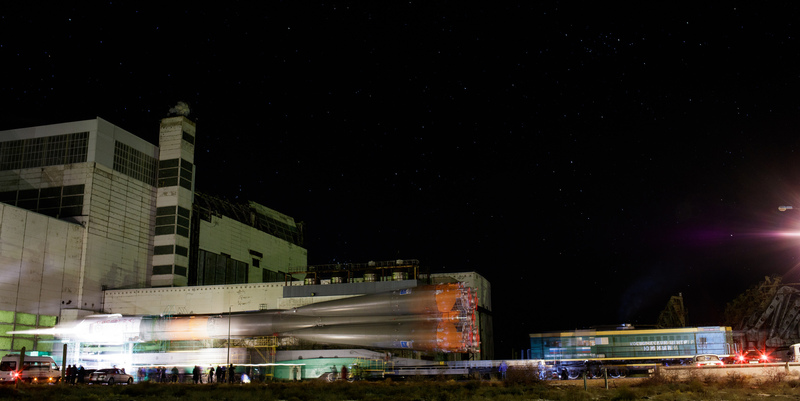 Soyuz TMA-19M had been undergoing final testing and processing for a period of months beginning with stand-alone testing and proceeding to vacuum tests, electrical testing and specialized testing of the Entry Module. Starting in November, the Soyuz FG rocket headed into its assembly sequence at the MIK 112 Launcher Integration Facility starting with the attachment of the four boosters to the core stage and preparations on the third stage and Launch Escape Tower. After the crew’s arrival, their first item on the agenda was a visit to their Soyuz spacecraft, set up in a test stand at Site 254. Climbing into the 7,200-Kilogram spacecraft, the three crew members familiarized themselves with the situation on board before going through suit-up to check the fit and integrity of their Sokol Launch and Entry Suits and also completing a suited ingress exercise with their actual spacecraft for the first time. While the crew entered a daily routine of tilt table sessions to prepare for microgravity, their Soyuz spacecraft headed to a dedicated processing facility where it was loaded with propellants and pressurized gases needed for its flight to ISS. 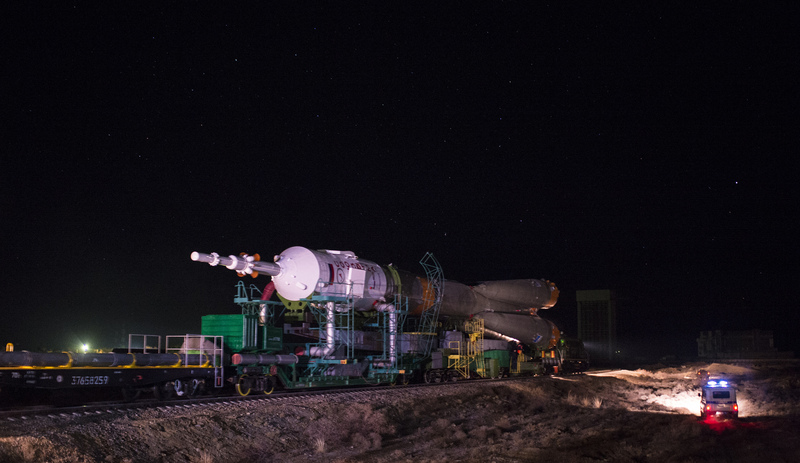 Once fueling was complete, the Soyuz returned to the Spacecraft Processing Facility to receive the final cargo items and go through another round of testing and inspections. Over the course of the last week, the Soyuz spacecraft was installed atop its payload adapter, had all of its protective covers removed and was enclosed in its protective launch shroud. The crew paid another visit to the Soyuz before it was packed up and moved to MIK 112 for installation on the Soyuz FG rocket which took place on Saturday. On Sunday, at the traditional early morning hour, Soyuz FG emerged from its assembly building under a clear, star-filled sky. Making its way to the historic launch pad at Site 1/5 from where Gagarin blasted off in 1961, Soyuz was greeted by a colorful sunrise. 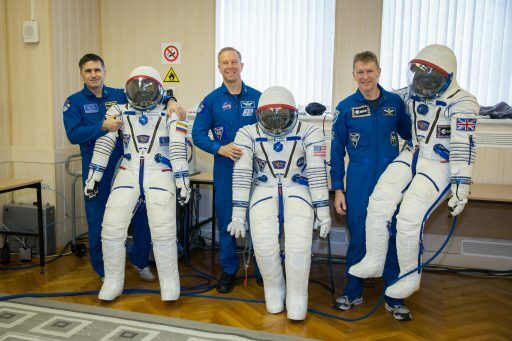 As is tradition, the prime crew members were not allowed to see the rollout of their rocket but the backup crew of Anatoli Ivanishin, Kate Rubins and Takuya Onishi attended the rollout. After being positioned at the pad, the Soyuz was put in its vertical launch position using the Transporter-Erector Device. The 50-meter tall Soyuz FG rocket was then secured on the pad so that the Transporter-Erector could be disconnected from the Soyuz and lowered to depart the launch pad. A series of checks were performed and the Core Stage and Third Stage umbilical towers were moved into position next to the launcher. 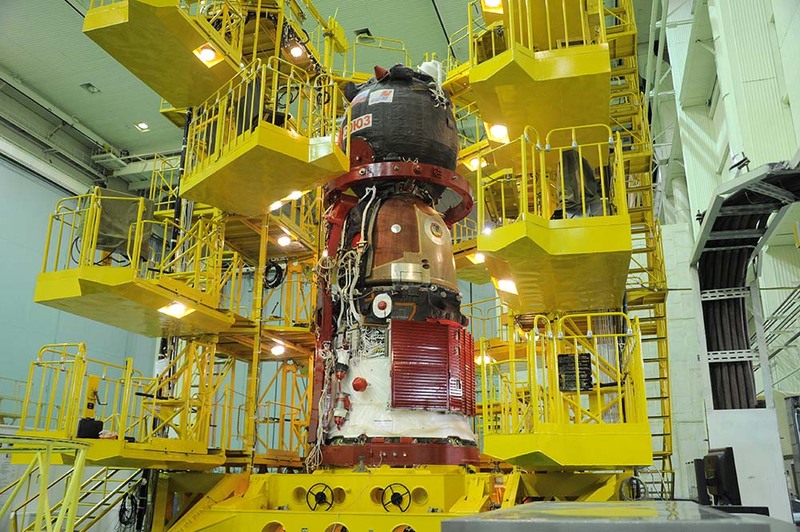 After a number of checks and preparations, teams began raising the two halves of the Soyuz Service Structure to enclose the launch vehicle and provide access platforms for workers, beginning the nominal L-2 processing flow. 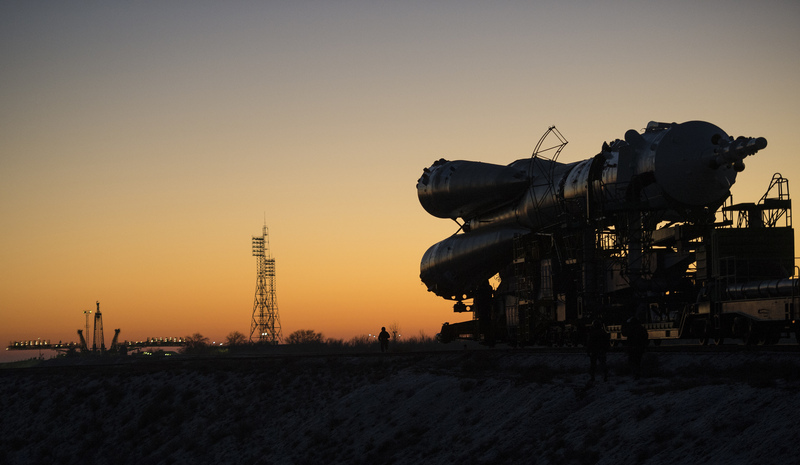 Soyuz FG will head into countdown operations on Tuesday, eight hours before the planned launch time that is set for exactly 11:03:10 UTC. 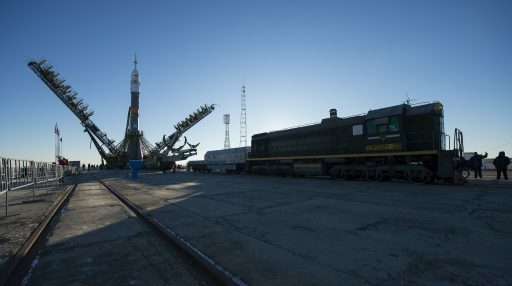 Following its thundering pre-sunset liftoff, the Soyuz will begin chasing the International Space Station, completing a nine-minute ascent into a Low Earth Orbit from where the Soyuz TMA-19M spacecraft can begin its four-orbit rendezvous process. Trailing ISS by several thousand Kilometers, Soyuz will be catching up quickly in its orbit that will be about 200 Kilometers below that of ISS. Therefore, the crew will not waste any time after liftoff and configure their spacecraft for orbital operations that call for a series of four engine burns to be performed over the course of the first two orbits of the flight. These maneuvers, two performed in the blind and two after orbital parameters can be measured, will deliver the Soyuz to a point from where it can begin its Automated Rendezvous Process using navigation data supplied by its KURS system. Soyuz TMA-19M is set for a fully automated docking at 17:24 UTC, arriving at the Rassvet Module of ISS. Hatch opening is scheduled a little over one and a half hours after docking to kick off a busy mission for the crew that will see hundreds of experiments, thousands of Kilograms of cargo arriving at ISS, a pair of spacewalks to begin 2016, and the end of the first one-year Expedition to ISS.